Central Bank governor Godwin Emefiele. 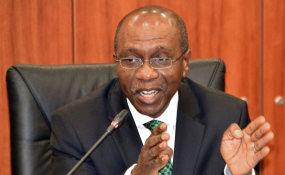 Abuja — The Governor of the Central Bank of Nigeria (CBN), Mr. Godwin Emefiele has responded to critics of the central bank's intervention initiatives in the textile and garment industry, maintaining that contrary to suggestions, the adoption of strategic approaches towards industrialisation of the economy had never yielded positive results in the past. The CBN governor, who said this in response to the Director General, Lagos Chamber of Commerce and Industry (LCCI), Muda Yusuf, who had in a statement urged the Federal Government to reconsider the recent CBN ban of forex to textile importers and allow for strategic approaches, said allowing for continued importation, dumping as well as smuggling- as insinuated by Yusuf, was not the best way out of the current situation. He said smuggling remained the greatest challenge to the country's industrialisation, adding that nothing could be achieved unless it is tackled head on. The CBN governor was speaking during a stakeholders' engagement on repositioning the oil palm value chain. He said: "Whereas, one will agree with his views on strategic approach but I begin to wonder what Muda means when he talks about strategic approaches. "In the past, the country had adopted what he calls a strategic approach, and that strategic approach to my understanding is that he says, "allow them to continue to import, let them continue to dump, let them continue to smuggle into the country, they will build those factories and industries. "When we addressed this issue three weeks ago, I had said that at a time in this country, Nigeria had 180 textile mills. The cotton that was being used, the spins, were coming out of Nigeria, produced locally. "But we lost jobs, farmers lost jobs, cotton farmers lost jobs. "Companies are still there in the northern and other parts of the country. We had companies which were into these jean cutting into yarns- they are dead today. "From yarn, you go into weaving, those companies are dead today. Three weeks ago when we held a meeting, there were only 15 textile companies out of 180 in the 50s and 80s and 90s in this country." He added: "Jobs have been lost and that is why it is very important that we know that we cannot continue to be talking about the fact that there is unemployed in the country, whereas, we ignore an industry that used to be the largest employer of labour in the country after the agriculture sector. "Anybody that is interested in the progress of Nigeria should not allow this to continue because we need to create jobs for our people. "Now, the strategic approaches had never worked and I want anybody to quote me- it has never worked. "It has never worked because what is the policy we are talking about? Increased duty. Today, duty on textiles is 45 per cent. I have a data here that tells me that textiles officially imported into Nigeria in 2015 is $9 million. In 2016, $6.9 million, in 2017, $7 million and in 2018, $9.7 million. "Is that the quantity of textiles that came into Nigeria these years? My answer is no. And yet, people say they pay duty, my answer is no. Because if you pay duty, then we would not be having official data that places import of textile (legal) into the country at just about $9 million. "We need to confront dumpers and smugglers in this country and the sooner we do so, I think the better for our country. "What happens? You import 10 containers of textile, you declare only one container and you pay duty on one container and you say you want the locally produced textile to be competitive, they cannot be competitive. "Or you increase your duty on textile or any product for that matter that we say we want to encourage local production and then a neighbouring country brings down the duty, it is dumped and pass through our porous borders: your textile or that product can never be competitive. He said: "The biggest elephant in the room- if you don't deal with smuggling, if you don't deal with dumpers, what you'll find is that even if you provide cheap funding, even if you provide electricity, we cannot do well." Emefiele, however, called for a concerted efforts and cooperation to ensure key sectors of the economy are revived in the interest of Nigerians.